There are many factors that could contribute to your loss of hearing. Do you find yourself turning the music in your car up higher and higher every year? Are you constantly asking your co-workers to repeat what they say? While hearing loss can be gradual and hard to notice, it can add up to a big problem over time. Your doctor can assess your habits and health and then administer a hearing exam to determine what is causing your hearing loss and the best way to treat it. Age is the most common cause of hearing loss. The loss of hearing with age is a condition called presbycusis, affects adults that are 65 years and older. 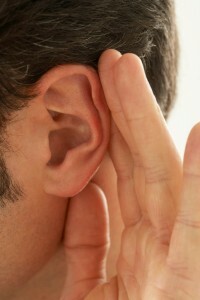 If you’re noticing that both ears equally have trouble hearing, and that it has slowly gotten worse, you’re not alone! As many as one third of Americans ages 65-74 and one half of Americans over age 75 experience presbycusis. Women and men experience the same occurrences of presbycusis, but women are more likely to lose lower frequency sounds and men are more likely to lose higher frequency sounds. Loud noises are another common cause of hearing loss. When you hear very loud noises, whether at a rowdy concert or when walking by a jackhammer, you lose the tiny hairs that line your ears. Unlike the hair on your head, these hairs cannot be regrown. One of the most obvious signs that you’re at risk for damaged hearing is experiencing ringing in your ears (tinnitus) after exposure to loud noise. Whenever you experience a head or ear injury, there is a chance you will suffer temporary or permanent hearing loss. The inside of your ear is incredibly delicate and the three small bones inside can shift after head trauma. Once the bones shift, sounds cannot properly reach your inner ear and the loss of your hearing can result. A bad blow to the head may rupture the eardrum or cause irreversible nerve damage, both of which can cause damage to your hearing. Otitis media or inflammation of the inner ear is a very common cause of hearing loss. Many children struggle with painful ear infections that can have lasting damage. For proper treatment and to prevent permanent damage, see a doctor as quickly as possible. Another common cause of childhood hearing damage is congenital hearing loss. Congenital hearing loss can be genetic or non-genetic. Genetic congenital hearing loss can occur when both parents carry the hearing loss gene and neither experience hearing loss (70% of cases) and when one parent experiences hearing loss and the other does not (30% of cases). Non-genetic factors include premature birth, lack of oxygen, low birth weight, and maternal diabetes. The loss of your hearing can be a side effect of drugs used in chemotherapy, medicine used during radiation, and antibiotics. There are approximately 200 drugs that list tinnitus and balance problems as side effects. Most times hearing will return after the medication is discontinued, but occasionally there is permanent damage. This entry was posted on Friday, June 10th, 2016 at 5:04 pm. Both comments and pings are currently closed.